Embrace of the Serpent provides a glorious example of modern black and white filmmaking, as well as a thoughtful exploration of the effect of colonial exploitation on native peoples. It’s said that a film shot in black and white frees the mind to see beauty without the distraction of color. 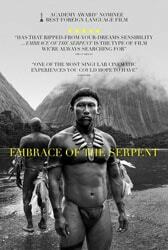 Embrace of the Serpent is a glorious example of this wisdom, as well as a thoughtful and sometimes jarring exploration of the effect of colonial exploitation on native peoples. Based on the diaries of two scientific explorers, this work of fiction is rooted in fact. It is centered on Karamakate, a young Amazonian shaman. He is thought to be the last surviving member of his people, and is approached by a sickly European explorer looking for a guide through the vast rainforest. The scientist is seeking the mythical yakruna plant for its powerful healing properties, but he is also drawn to it because of the legends suggesting that it may reveal the essential secrets of the universe. Forty years later, an aging Karamakate is approached again, this time by an American seeking the illusive yakruna. Karamakate is unsure of himself and his fading memory, but he embarks once more on the spiritual journey in hopes that he can find it—and himself—again. Embrace of the Serpent seamlessly interweaves the early and later trips to great effect, following nearly duplicate paths separated by time. The film beautifully depicts the battle between the mystical infinitude of a massive jungle and the encroachment of the outside world. The topicality of this Oscar nominee is undeniable; it directly confronts the issue of whether or not secluded native peoples should be introduced to modern information, but it does not rush to answer the question. This challenging and original narrative offers horror, beauty, and contemplation while leading to its own dubious conclusion.